As the number of people I am following on Google+ grows, following the flow of posts in the main Stream can get overwhelming. Today's 30 Days With Google+ post takes a look at some tips for filtering the posts and keeping things under control on Google+. Just during the time I have been using Google+, Google has made some major improvements to the way posts and comments flow. One of the issues I noted early on is that a post would show the name of everyone who +1'd or shared it. If there are four or five it may not be a problem, but a popular post--like one of the photos posted by Google co-founder Sergey Brin--can have thousands of +1s and hundreds of shares. I would have to scroll and scroll just to get to the comments on the post, never mind any posts beneath it. 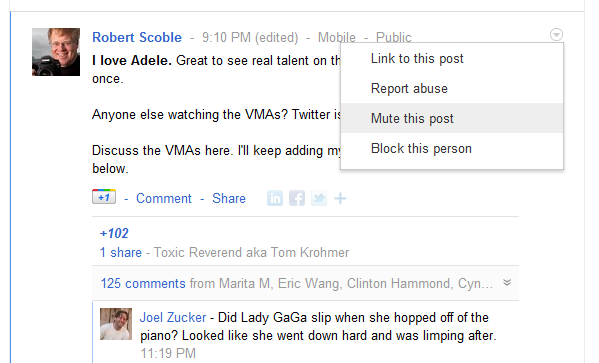 You can mute a post to remove it from the Google+ Stream. Another early issue was that a comment thread couldn't be collapsed once it was expanded. Again, that may not be an issue on a lot of posts, but if you made the mistake of expanding a Robert Scoble post you might be scrolling for a while before you could get down to the next post. Google has dealt with both of those issues--collapsing the names of the +1s and shares, and enabling comment threads to be both expanded and collapsed. Things may still get chaotic at times, so I've picked up a couple other techniques for taming the Stream. Some Google+ posts may just be silly or annoying. I could ignore it, and hope it will disappear as new posts come in. But, Google+ cycles posts to the top as they receive new comments--so if it turns out to be popular it stays consistently at the top of my Google+ Stream. Whatever my reason might be, I can choose to simply ignore an individual post (and the comments that go with it). Muting a post is only effective for that specific post, so any new or subsequent updates from that same user will still show up. I can just click the drop-down arrow at the upper right of the post and select "Mute this post". One of the advantages of sorting my social network into Circles is that I can also easily filter the posts I am viewing by choosing specific Circles. By viewing individual Circles I can filter out particularly "noisy" contacts (I'm looking at you Mr. Scoble), and be sure to see updates from family members, or close friends. Google+ makes it very easy to view content by Circles. On the left side of the Google+ screen, beneath the link to view the main Stream, all of my Circles are listed. I can simply click on the Circle I want to view, and just as easily click the word Stream to revert to the main pipeline. I only have about 130 people in my Circles, and most of those people rarely post (or at least rarely post to Public, or to any Circle they might have me in). Still, the few who do contribute to the Google+ content tend to post a lot, so I have no shortage of updates coming into the Stream. After I have scrolled (and scrolled, and scrolled) down my Google+ Stream to catch up on posts that may have flowed past while I wasn't looking, it can be tedious to have to scroll (and scroll, and scroll) back to the top. Thankfully, a new feature from Google takes care of that. I can click on the black bar at the top of the Google+ browser window--the bar between the address bar in the browser and the Google+ logo at the top of the window--and instantly jump back to the top of the Google+ Stream. Pretty slick.